Cobalamin generally known as B12 is a water soluble vitamin which is one of the vital vitamins that plays a very crucial role in maintaining normal function of brain, nervous system, red blood cells formation, involve in DNA synthesis, and metabolism of the cell as well as energy production pathway. B12 cannot be synthesized in human body and must be supplied by your diet. The only source of B12 is animal products (Red meat and dairy food). During stomach digestion, the acidic environment facilitates the breakdown of B12 that is bound to food. 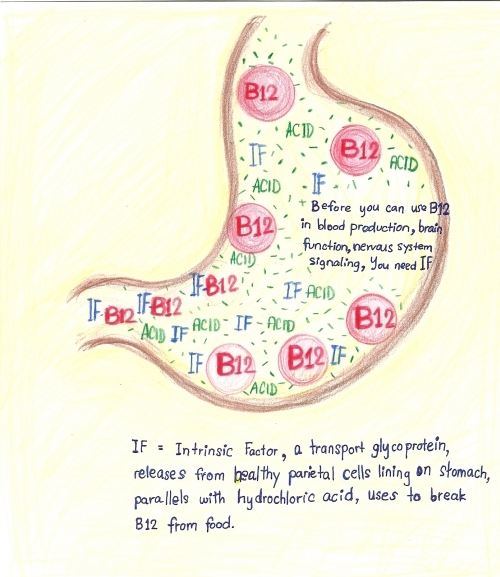 Intrinsic factor (IF), a glycoprotein released from parietal cell (a cell in the stomach, releases acid to aid food digestion) parallels with hydrochloric acid (acid in stomach), binds to B12 and forms B12-IF complex subsequently aids the absorption of B12 at the terminal Ileum(the end part of the small intestines). While in terminal Ileal mucosal cells(cells lining on the surface of the Ileum), the Intrinsic factor is destroyed; B12 then binds to Transcobalamin II, a transport protein, and transport into blood circulation and deliver B12 to liver, brain, bone marrow and other cells. See Figure A. What is the function of B12? There are two enzymes in human body that are depending on B12 as a cofactor. Methylcobalamin (an active form of B12) and Folic acid are required for this enzymatic reaction. When this reaction is impaired, Folate metabolism is deranges, leads to abnormal DNA synthesis, abnormal cell production and eventually results in macrocyte (enlarged cell). If this happens in blood production system, some people would have megaloblastic anemia (anemia with enlarged red cell), if it happens with cells in your tongue, the tongue will be glossy beefy red and sore, some might have diarrhea if their bowel’s cells become generally enlarged. The low levels of B12 will interfere with Methionine synthase converting homocysteine (homo-sis-teen- and amino acid in the blood) to methionine, therefore, results in low levels of methionine and high blood levels of homocysteine. Low methionine is partly responsible for the neurological complications, since Methionine formed in this reaction is needed for the production of choline and cholin –containing phospholipid, which normally are parts of neurotransmitting and signaling especially in nervous tissue. What happens if B12 low? You might have one of the following problems or both. Ø Diarrhea with sometime moderate weight loss. 2) Neurological disorder: Clinically varies from as mild as numbness to rarely severe psychosis. Ø Vegetarians who eat no meat/dairy products. Ø Elderly with typical ‘tea and toast’ diets. How does doctor diagnose B12 deficiency? How to treat B12 deficiency ? followed by maintenance dosage of 1000 mcg every one to three months.